From blocks of old, estate grown Shiraz vines planted to the banks of North Para River at Nuriootpa. 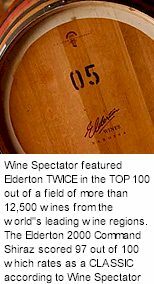 Elderton was transformed from a vineyard supplying quality fruit to other wineries into an internationally renowned estate, having won much acclaim for Shiraz. There are twelve blocks of Shiraz at Elderton, some as old as a hundred years, planted to deep alluvial soils over limestone. Combined with a Mediterranean climate and minimal supplemented irrigation, this creates what savant Robert Parker describes as the perfect Shiraz vineyard. Samuel Elderton Tolley established the Elderton vineyards in the early 1900s. Under the stewardship of the Ashmead family, the vines are now source of world class Shiraz wines. Grapes are harvested throughout the cool of night, at an optimum ripeness and maturity between 14 and 15 baume. This allows a quick delivery to the winery for crushing before any spoilage can occur. Grapes are crushed, inoculated to a choice strain of yeast and vinified in concrete open top fermenters at 20C to 28C for several days, mostly headed down under oak boards. The finished wine is matured two years in a selection of seasoned 500 litres American oak puncheons. A rich and vibrant dark purple colour. Pronounced nose of chocolate and vanilla, plums and toasty, cedar oak. An engaging palate showing exceptional length with amazing purity of fruit, offering generous helpings of of plum, chocolate, and blackberry flavours with a meaty edge, and a fleshy rounded mouth feel, followed by fine, lingering and integrated tannins. A perfect match to richly flavoured meats, game, and mature cheddars.